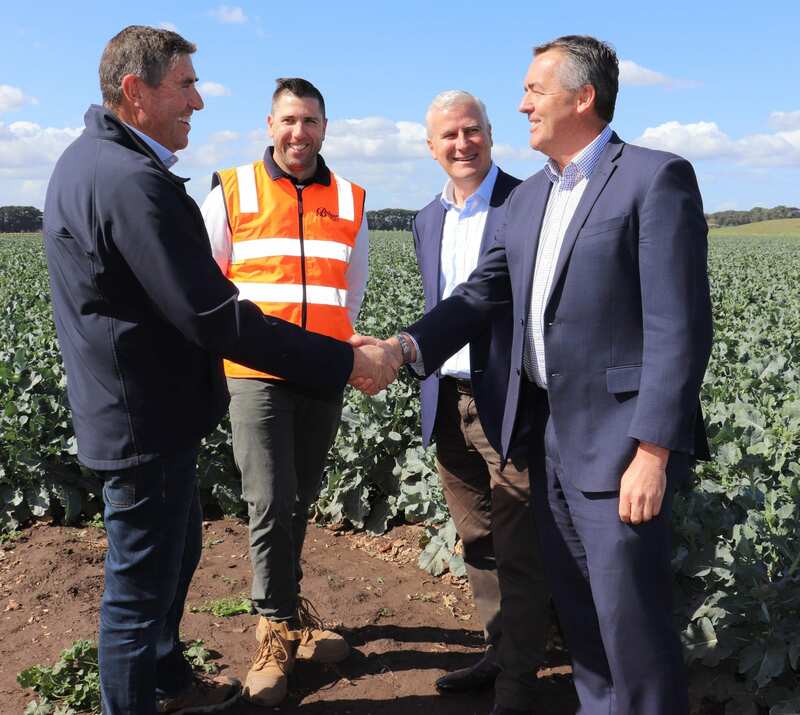 Bulmer Farms director Bill Bulmer and general manager sales and supply chain Kaine Bulmer hosted Deputy Prime Minister Michael McCormack and Federal Member for Gippsland Darren Chester on their farm for the $10 million Lindenow Valley Water Security Scheme announcement. Federal Member for Gippsland Darren Chester has secured $10 million from the Federal Government to help safeguard a reliable water supply for the irrigators in the Lindenow Valley. Mr Chester announced the funding for the Lindenow Valley Water Security Scheme alongside Deputy Prime Minister and Minister for Infrastructure, Transport and Regional Development Michael McCormack. Mr Chester last month wrote to Mr McCormack seeking his support to help the irrigators to embark on on-farm water storage projects to better withstand the impact of drought. “This $10 million fund will help farmers to finance large-scale water storage projects on their farms that will enable them to take advantage of high flows in the Mitchell River during spring,” Mr Chester said. Bulmer Farms director Bill Bulmer said this past year had been extremely difficult for growers in the Lindenow Valley. “We estimate that we’ve lost between 15 and 20 per cent of revenue through the valley, which equates to about somewhere between $15 to $20 million,” Mr Bulmer said. In February, Mr Chester secured $31 million from the Federal Government for phase two of the Macalister Irrigation District modernisation project, which is centred on the Newry and Stratford areas. Farmers from drought-declared areas can now apply for a rebate of up to 25% or up to $25,000 for on-farm water infrastructure spending for grazing livestock under the $50 million On-farm Emergency Water Infrastructure Rebate Scheme. The Federal Government has also established the Future Drought Fund to provide a secure revenue stream – which will grow to be worth $5 billion – for drought resilience, preparedness and recovery projects for farmers impacted by drought.